Background: Bioscape Digital is a health IT startup that makes tablets for hospitals. The tablets are meant for the patients and consist of educational videos about symptoms, insurance, etc. Summary: Researched and created storyboards to implement a unique UI for each department under a hospital. Redesigned and reorganized the UI for the users to find contents easier. Worked with Data Scientist, Engineers, and CEO. Hospitals are sending tons of new content to put on our tablet, and the tablet UI has been getting cluttered and disorganized. Patients thus are having difficulty in finding specific content such as educational videos. How might we organize the UI in a way that’s easy to find relevant content? Below are the original UI and basic notes. I first discussed a lot with Account managers, familiarized with the current tablet UI, wrote down any feedback that they heard during their site visits, and categorized various feedback into potential areas to improve. Example Feedback: Users don't know the difference between Health & Wellness and Going Home? ; Users are confused about Primary Care Sign up and Patient Portal Sign up? ; Users are unclear about which to click to get to a health educational video. The heat map reveals which categories were being more used through a darker blue color. I created such through importing data from Salesforce under Medical City Plano, summing usage time of all content under each category through Excel pivot table, and creating the data visualization on Adobe Illustrator. 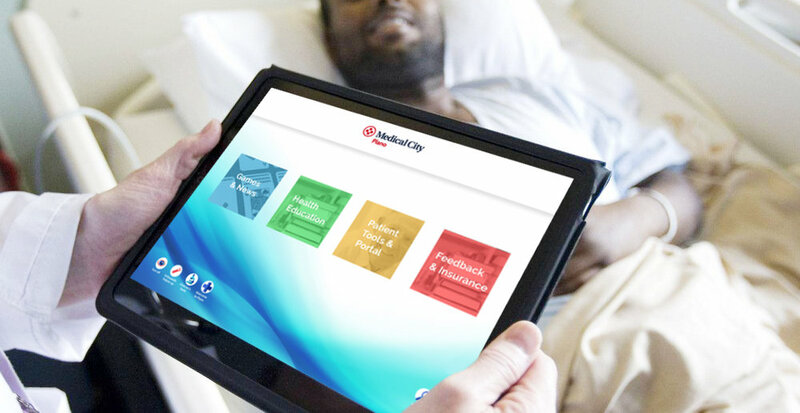 When I finished creating heat maps for 50+ tablets under Medical City Plano, I realized that many categories showed no significant trends - although games and insurance were always dark blue, other categories were completely inconsistent. I spent some time to design more specific screensavor. I actually went to a site visit at Atlanta Medical Center (South) to ask for feedback and make immediate changes. Below are the redesigned screens designed over the span of 2 weeks. To test the prototype, I visited Atlanta Medical Center North and South to talk to the users about the product. I prepared case questions to test their navigation skills on my new design. I asked 12 patients from the 2 hospitals. With such note, I had the very strong understanding of the UX. I noticed a clear improvement in their performance both quantitatively and qualitatively, where the overall time decreased and there were less confusions within the navigation. However, I faced some problems. Solution 3 was immediately taken away, since the new UI had visible increase in the usages and simplicity of our product. Our CTO decided we pass both Solution 1 and Solution 2, where we keep the design elements as similar as possible to the previous version and we would hand out a brochure to ease the transition to the new update. I informed the IT team to set up an experiment to track click thoughts specifically on Hospital Videos to constantly update the top 3 content on each categories. It was definitely very interesting to take feedback from real users and also learn to handle negative reception from my designs in the real world. I handled such from the large positive receptions by a lot of kind users who are excited about our product and its future updates. I am glad to be part of Bioscape Digital's milestone and hopefully can see them grow tremendously to increase patient engagement and experience at more hospitals in America! Huggies, a diapers brand, contacted us after they saw the new update of specific UI for the Mother and Baby Department. They want to put coupons and promotion videos on our Mother and Baby Department tablets.